Back when I was a working mom in the Philippines, I rarely baked. It wasn't because I didn't like doing it. Time constraints is more of the reason. But since I got here in the US, baking has been part of my life. Not only do I have all the time in the world to bake now that I am a Stay At Home Mom (SAHM)...there are also these cravings for Filipino baked goodies that I have to satisfy. If I won't bake, we won't be able to enjoy baked treats that we miss like Inipit, Pan de Coco, Ensaymada, Ube Cake, Mango Cake, Sanrival, Lengua de Gato, Chocolate Crinkles, Brazo de Mercedes, Egg Pie, Cassava Cake, Mamon, Custard Cake, Food for the Gods, and of course our breakfast favorite, Pandesal. Over the years, I've embraced baking more and more, and now that my 11-yr old and 8-yr old daughters are showing interest in the kitchen, baking has become a favorite bonding activity between us. There are times when we are just watching TV and then we will suddenly think of baking something to munch on. If we have overripe bananas, we make banana bread...but if we don't, we usually end up baking cookies like Peanut Butter Cookies, Pecan Sandies and Chocolate Chip Cookies most of the time. But lately, the girls are so into these Whole Wheat Cinnamon Oatmeal Pecan Raisin Cookies. We've been baking these almost every week for 3 months now and we just don't seem to get enough! I used to make Oatmeal Raisin Cookies but my daughters didn't like them as much. Well, I honestly don't blame the girls 'coz these cookies are way better! The added cinnamon and toasted pecans and the use of whole wheat flour bring the regular oatmeal raisin cookies to the next level. These cookies have the right amount of spice from the cinnamon, sweetness from the raisins and crunch from the pecans and oats. And the best thing is the added fiber from the whole wheat flour! You should try this recipe! 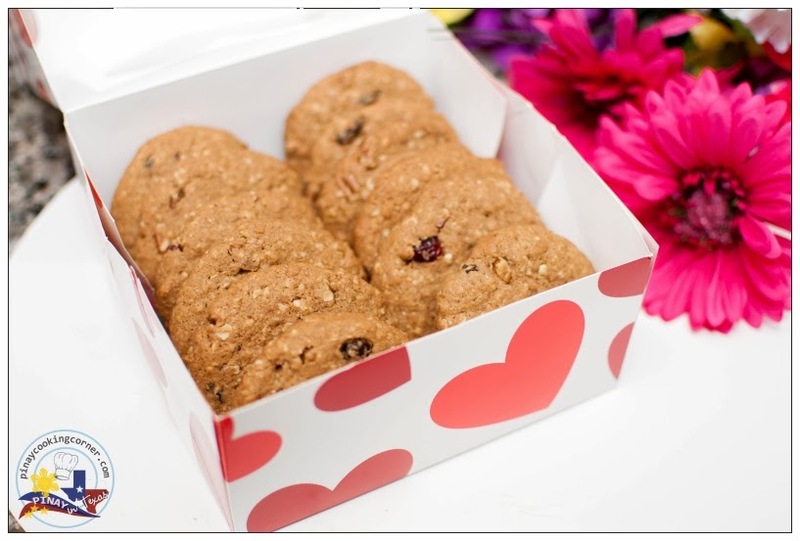 I'm sure you'll love Whole Wheat Cinnamon Oatmeal Pecan Raisin Cookies! They're perfect for snack and even for dessert! They also make great holiday and even Valentine treats! 1. Preheat oven to 350°F. Line 2 cookie sheets with parchment paper. 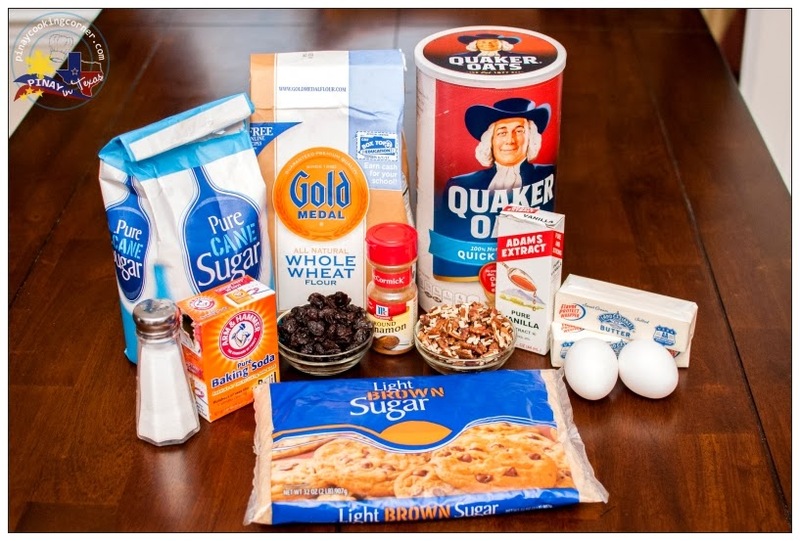 In a bowl, combine flour, cinnamon, baking soda and salt. 2. In another bowl, cream butter and sugars using an electric mixer on medium speed until light and fluffy. Add eggs and vanilla and continue mixing until well combined. Reduce speed to low. Gradually add flour mixture and beat until well incorporated. Stir in oats, pecans and raisins. 3. Drop rounded mounds of dough (about 1 Tbsp to 2 Tbsp depending on desired size) onto prepared baking sheets. Bake in preheated oven for 10 to 12 minutes. Let the cookies cool a few minutes on the baking sheet. Transfer to a wire rack to cool completely. Store in airtight container. 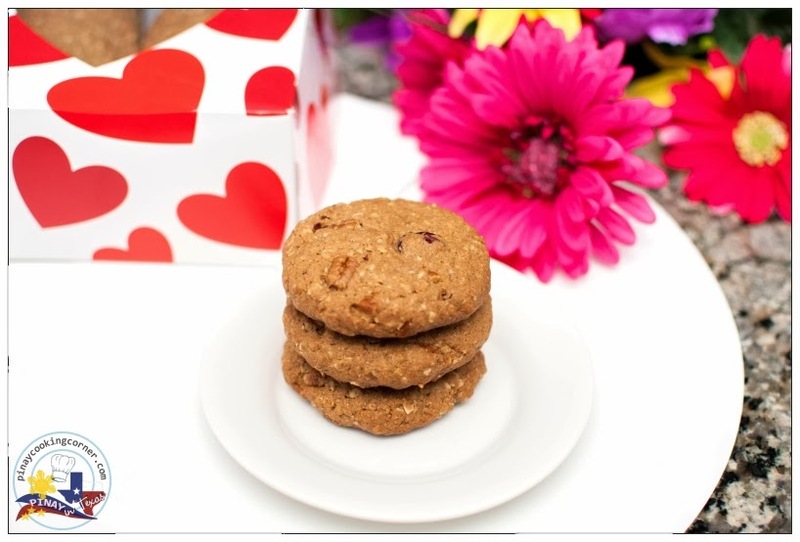 I'll be donating 2 dozen of these Whole Wheat Cinnamon Oatmeal Pecan Raisin Cookies to the #Help4Harleigh Online Bake Sale which Mark Tisdale of Javelin Warrior's Cookin w/ Luv is hosting for his 3-yr old niece, Harleigh. In November 2013, Harleigh was diagnosed with Glioblastoma brain tumor and has been fighting her battle since then. Harleigh’s family are raising funds to help pay for her medical bills. In my own little way, I want to help this precious little girl in her fight. I hope you can join me and other bloggers in this cause. To know more about #Help4Haleigh, visit Harleigh's Give Forward page. 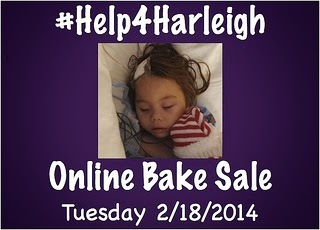 For those who want to participate in the Online Bake Sale for Harleigh by donating baked goods, cookwares or cookbooks, sign up here. Pledges will be accepted until February 16, 2014. Bake Sale starts on February 18, 2014. Show Harleigh you care! Donate and help spread the word about the bake sale! 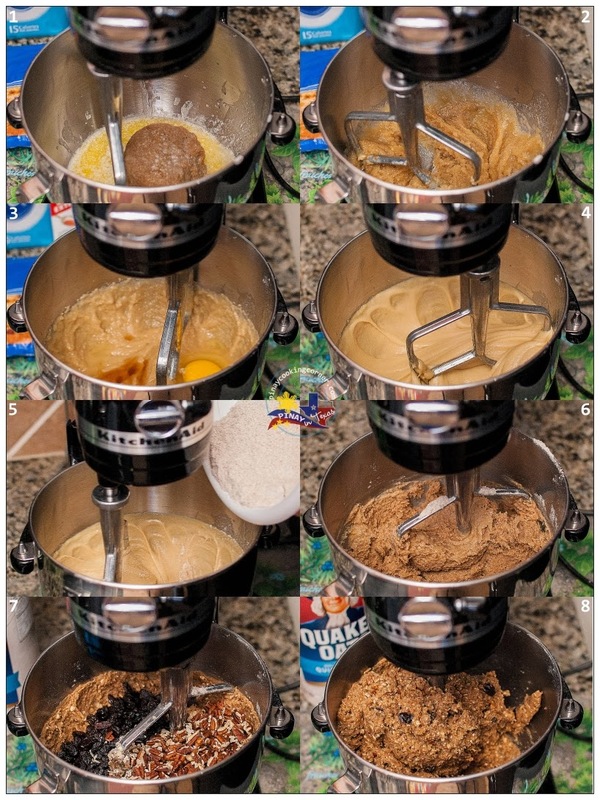 Crunchy munchy cookies, loved that fact you used oatmeal. These cookies look lovely. I like that idea of using pecans and of course raisins..yummy! Tina, I have great respect for you, I've seen you standing up for many good causes and I'll be tweeting your post today hopping to make people aware of Harleigh's condition and what they can do for her. May God bless her and give her and her family the strength to fight this battle and win it too! Thank you, Muna! That would be a big help! Thanks so much for helping to spread the word, Muna! I'm very grateful! Oh YUM! Toasting the pecans first. What a great idea! I'll definitely be checking these out at the bake sale! These cookies sound delicious, Tina. I love the addition of the pecans with whole wheat flour. 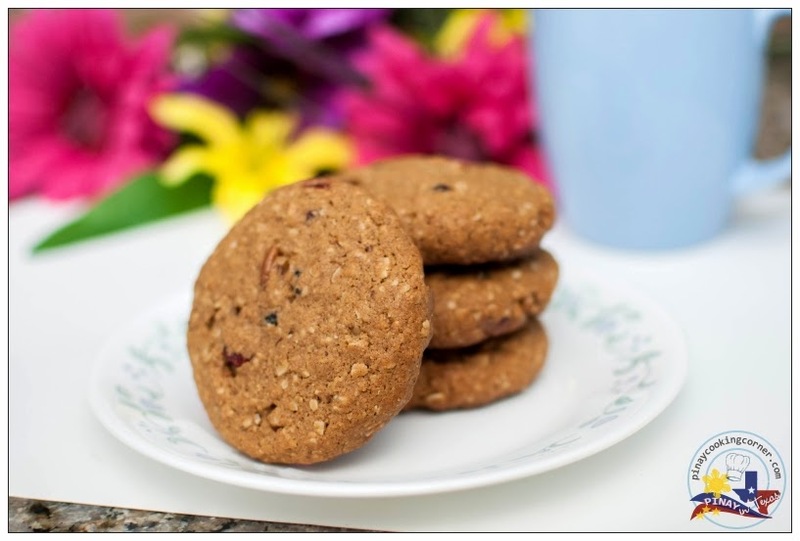 I'm a big fan of oatmeal cookies in general, but I've never tried it with whole wheat... Thanks so much for the bake sale shout out - I'm very grateful and appreciate all the support! What you're doing for your niece is truly wonderful, Mark and I'm very happy to be of help!